This Strawberry Layer Cake is full of strawberry flavor! 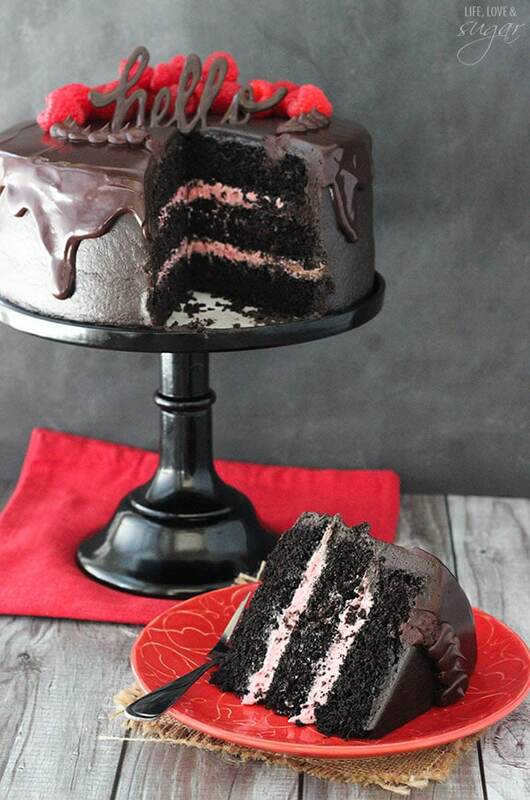 It uses a full cup of strawberry puree for the cake flavor and is covered in strawberry frosting! 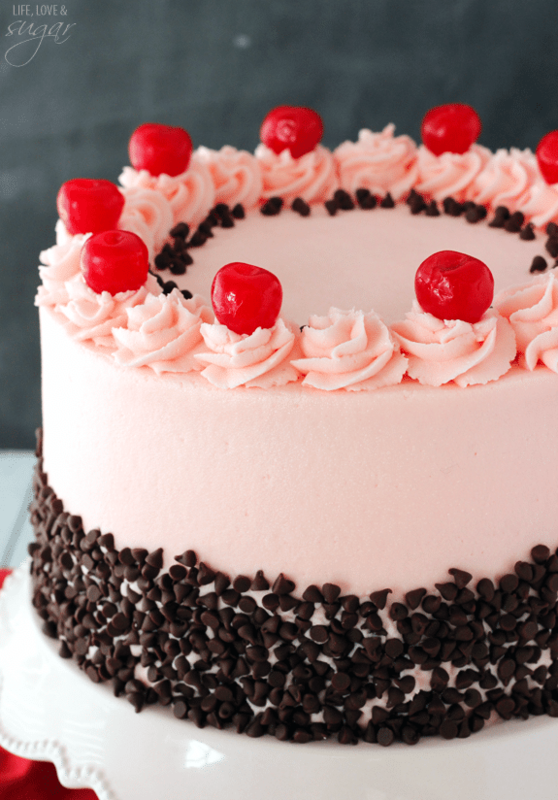 It is the perfect cake for a strawberry lover! I am SO excited to share today’s post with you! 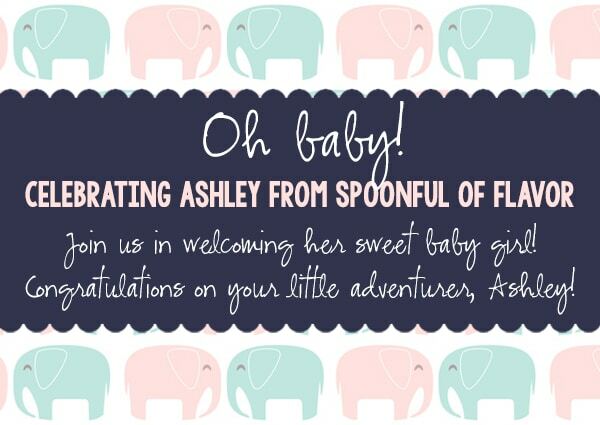 First of all, today is a Surprise Virtual Baby Shower for my friend Ashley, from Spoonful of Flavor. I met Ashley a couple years ago, when I attended my second blog conference. We became quick friends and I’m always excited when I know we are both going to be in the same place and get to hang out. She hosted a retreat last October in Florida that was a blast, too. There aren’t a ton of bloggers that I know that also work full-time (even though I’ve recently gone part-time) and she is one of them. She is smart, savvy and someone I’ve definitely gone to for advice many times. We’ve had several conversations over the last year about working like crazy, balancing it all and trying to get pregnant. I am SO thrilled for her to have her sweet baby girl arriving in August. I know she’ll make an awesome mom! Going off of her nursery theme, I decided to use the colors pink and teal. Just my luck the sprinkles I chose had some dark purple in them that almost looks like navy, which was her third color. Unfortunately the sprinkles that I thought seemed pretty teal ended up being more blue than I thought. I noticed when I was coloring the frosting, so the frosting is a bit bluer than I’d planned. Oh well! Speaking of the sprinkles, have you seen the new line of sprinkles from Sweetapolita? I’ve always loved her sprinkle mixes and now you can buy them from her! These are the ones I used. Then I added the elephant to finish off the adventurer theme. He’s complete with a sprinkle ear – my favorite part! 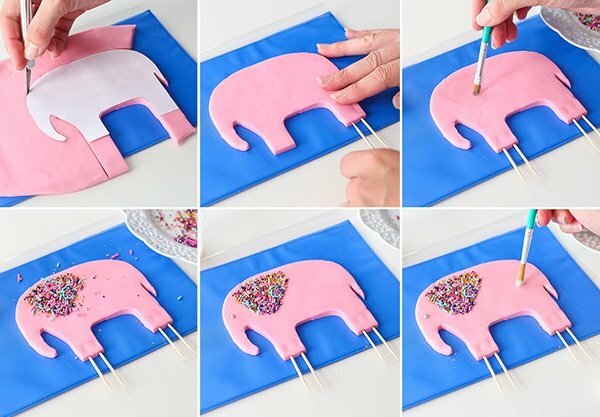 🙂 You’re going to want to use gum paste, or a mix of fondant and gum paste, to make the elephant. If you just use fondant, it will take FOREVER to fully harden – if ever. Gum paste is made to dry much quicker and firmer, so that’d be my suggestion. So let’s talk a bit about the recipe. This strawberry cake was a doozie to get right. I played with so many versions of it, it was crazy. I played around with the moisture of the cake – sour cream, milk, buttermilk – and the leavening – baking soda vs baking powder. Ultimately I found the sour cream to give the moistest cake and a mix of baking soda and baking powder to be best. I wanted to stick with all baking powder because the soda altered the flavor and color of the cake, but it also helped it bake better (for lack of going into too much detail). I ended up with a mix of the two to get the best of both worlds. I LOVE the final result! 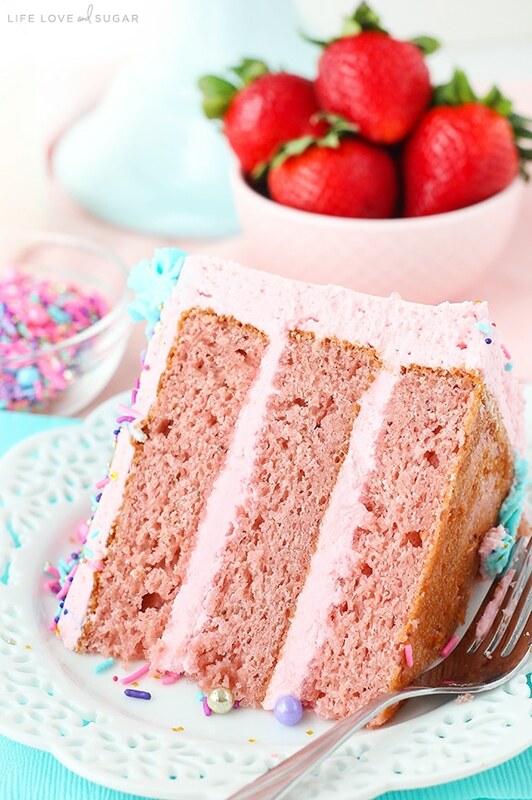 It’s super moist, fluffy and FULL of strawberry flavor with a whole cup of strawberry puree! 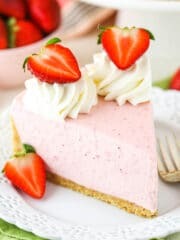 Just a note about the flavor and the strawberries – because the full flavor of the cake comes from the strawberries you want to be sure to have great tasting strawberries or you won’t get the flavor in the cake. When making the batter, be sure to fully cream the butter and sugar. 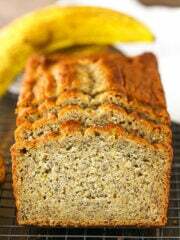 It adds air to the batter than is important when it bakes to get that nice, fluffy texture. For the strawberry frosting, I also strawberry puree. However for the frosting, I strained the puree through a fine mess sieve first. This removes the pulp and seeds, so that you get the flavor and light pink color but you don’t have the pulp and seeds ruining that perfect smooth finish. I wanted to really go strong with the strawberry flavor, so I added a bit of strawberry extract to the frosting too. That’s totally optional. It’d be delicious without it too – I just LOVE LOVE me some strawberry. I also added a bit more pink color to the cake and frosting. You certainly don’t have to. 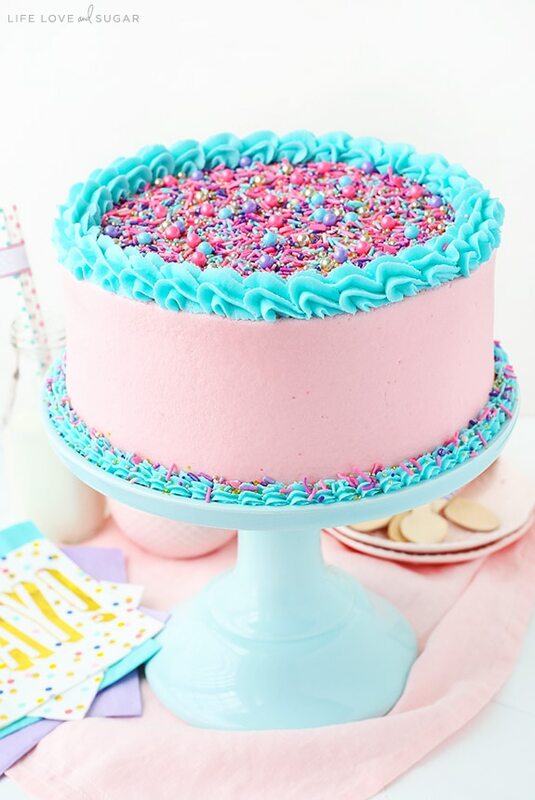 I wanted the full pink effect for the baby shower cake and wanted the color of the frosting to match the sprinkles a little more. If you choose not to add coloring, you’ll have a much lighter pink. 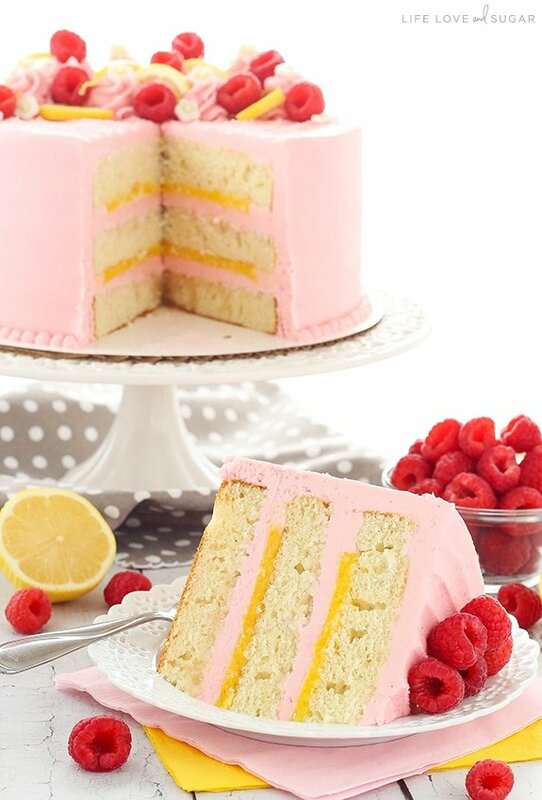 The cake will also be a duller shade of pink. Once the cake is baked and the frosting is ready, it’s time to build and frost the cake. To get that nice, smooth finish with buttercream, check out my tutorial here. Once thing I’ll note is that I added a bit more strawberry puree (moisture) to the frosting than I normally would to get the flavor in there. It made the frosting a bit thinner than I normally use. It’s still plenty thick to frost the cake, but when it comes to smoothing the cake with the paper towel in the tutorial I linked to, the frosting will be a bit sticky. I refrigerated the cake for about 5 minutes and then did the paper towel. 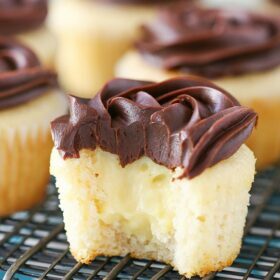 You won’t want to refrigerate it too long first though, or the frosting will be too firm to smooth. As for the super cute elephant on top, I’d actually recommend making him in advance so you have time to let him firm up and dry. I colored the gum paste with a mix of pink and burgundy icing color (the same as for the frosting). Feel free to cut out your own shape elephant, or download mine. Cut it out and use it to trace the elephant with an exacto knife to cut him out. 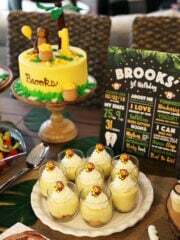 Next, stick some toothpicks or thin skewers into his legs so that he can stand up on the cake. I then used my exacto knife to mark the ear area and used a sugar solution to paint the area and get it sticky. To make the sugar solution, I dissolve some gum paste in a very small cup of water. 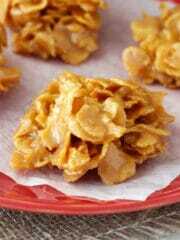 I usually add 1-2 tablespoons of water and then dissolve gum paste in it – about a small grape size worth. I figure the more gum paste, the more stickiness. Add the sprinkles to the sticky area, lightly pressing them onto the elephant. Allow it to dry for 5-10 minutes, then brush off the excess sprinkles. I also put a small drop of sugar solution in the eye area and added a sprinkle for the eye. I lightly dusted my elephant with a bit of white pearl dust to give him a bit of sheen, but that’s totally optional. Set the elephant aside to dry and harden. Once he’s ready and the cake is smoothed and beautiful with sprinkles, press him into the top of cake and you’re done! This cake was so much fun to make and even more fun to eat! It makes a great baby shower cake, but of course you can forgo all the decoration and just make one heck of a delicious strawberry layer cake, if you prefer. 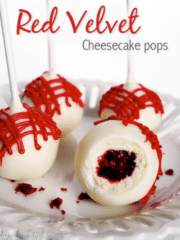 The flavor is outstanding and for a strawberry lover like myself – it was to die for! Thanks so much for joining me to celebrate Ashley and her sweet little girl, arriving soon! Be sure to check out all the other tasty food everyone else “brought” to the shower! It all looks so good! 3. Add sour cream and mix until well combined. 4. Add eggs in two batches, mixing until well combined. 6. Add the strawberry puree and mix until well combined. 8. 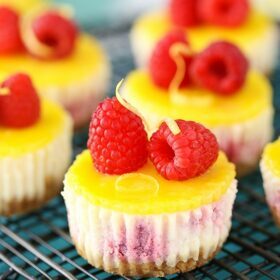 Divide batter evenly between the cake pans and bake 24-26 minutes or until a toothpick inserted comes out with a few crumbs. 2. Slowly add about 1/2 of the powdered sugar, mixing until smooth between each addition of powdered sugar. 3. Scoop out about 1 cup (240g) of frosting and set it aside for the teal blue frosting. 4. 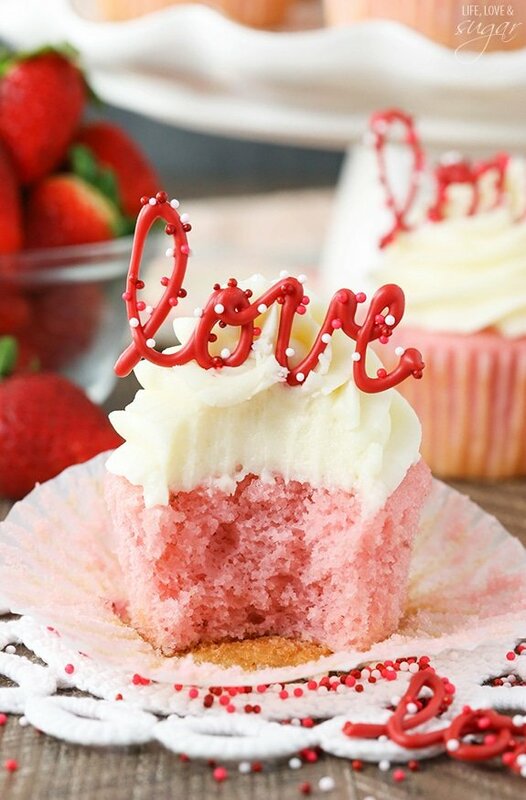 Add the vanilla extract and 6 tablespoons of strawberry puree to the remaining frosting and mix until smooth. 5. Slowly add the remaining powdered sugar, mixing until smooth between each addition of powdered sugar. 6. Add remaining strawberry puree, if needed, and strawberry extract and mix until smooth. 7. Color the frosting with pink and burgundy icing color, if desired. 8. 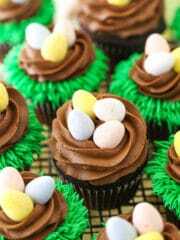 For the teal blue frosting, add 2-3 teaspoons of water, if needed to thin it out a bit, then color with teal and sky blue icing color. 3. 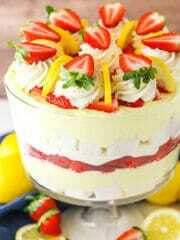 Spread 1 cup (240g) of strawberry frosting into an even layer. 5. Add the second layer of cake, then another cup (240g) of strawberry frosting. 6. Top the cake with the third layer of cake. 7. Frost the outside of the cake with the remaining frosting. For help getting a smooth finish, refer to my tutorial. 8. Pipe shells around the bottom and top edges of the cake using the teal blue frosting. I used Wilton tip 21 for the bottom and Ateco 844 for the top. Wilton 2D is similar to the Ateco 844 tip. 1. 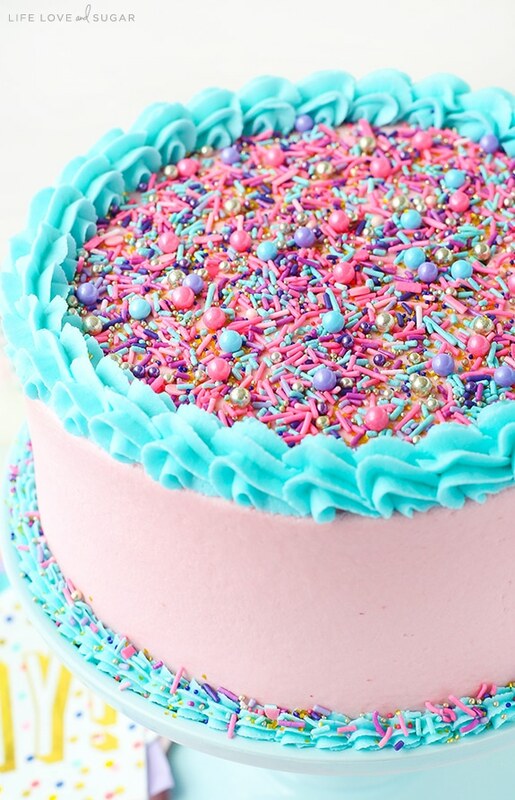 If desired, top the center of the cake with sprinkles, then add a few around the bottom. 2. To make the elephant, please refer to the instructions and photos in the post above. I suggest making the elephant a day or two in advance, so it has time to dry and harden. This cake doesn’t need to be refrigerated, but it can be. It’s best served at room temperature and freshest for 2-3 days. I’ll often bake the cake layers the night before, put the cake together the next day, then either serve the cake that day or the next. It’s best to store it in an air-tight container, like a cake carrier. I love this one. The cupcake holders come out and then you have a nice and tall place to store a cake. 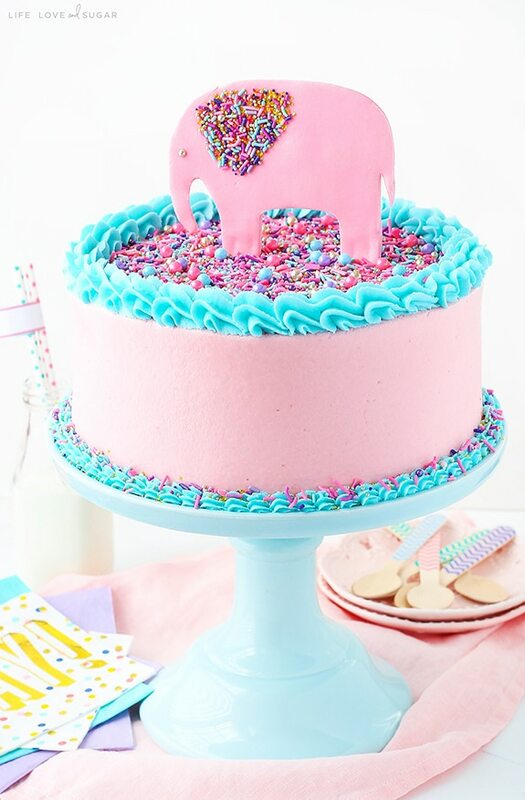 I’d suggest adding the elephant on top shortly before presenting the cake. If you refrigerate it, it will sort of melt. If it’s stored in with the cake, the moisture will likely mess it up too. Store the elephant in a cool, dry, dark place. * Strawberry puree is just strawberries that have been put in a food processor or blender and blended into liquid form with no chunks remaining. That elephant…he’s my favorite part! SO cute with his sprinkle bling! The inside looks perfectly pink, too. This is heavenly! Lindsay, this cake is STUNNING!!!!!! OH MY GAWD!!!!!!! Ashley is going to love this! Your cake is absolutely beautiful! I just found your post last week, and I already made your no bake strawberry lemon cookie pie. Needless to say, it was a hit! Our black raspberries are ripening, and I can picture them in some of your other recipes. You should be so proud of yourself!!! Such a cute nursery theme! And what a goooorgeous cake, she’s one lucky lady! Oh my gosh, this cake is AMAZING!!!! You ladies are the best. This was the sweetest surprise ever to wake up to this morning. The virtual shower could only be more perfect if we were all together to celebrate. Lindsay, your talent never ceases to amaze me but I have to say that this is my favorite cake ever. 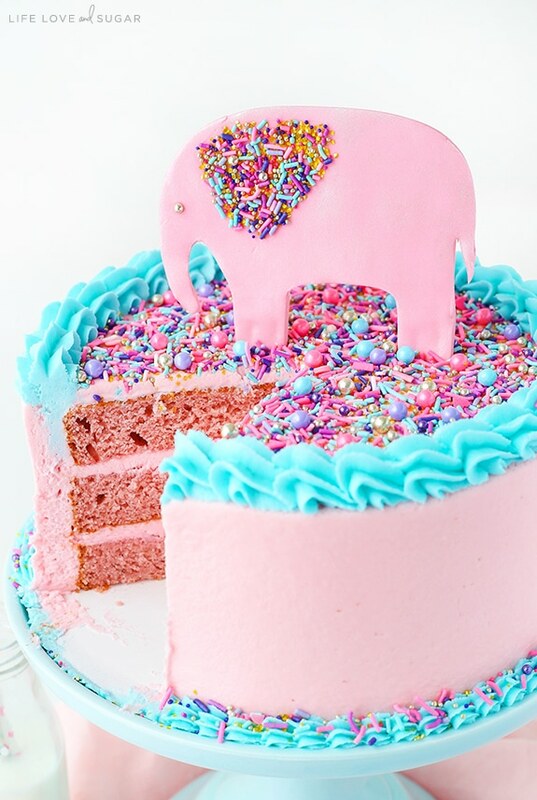 I LOVE the strawberry theme and the elephant is the best thing ever. Thank you, thank you, thank you!!! Thanks so much Ashley – I’m so glad you like it! 🙂 I agree – too bad we couldn’t all be together in person. Someone needs to host another retreat, ha! I can’t get over the cuteness of this cake, you are so talented Lindsay! I know Ashley would love this, if only we could all be together to dig in! This cake is awesome Lindsay! I can’t get over that little elephant and his bling ear 🙂 🙂 I guarantee you if I tried to freehand a gum paste elephant it would look like a kangaroo or something, so good thing you included a template 🙂 🙂 Happy day to you Ashley, congratulations!! What a beautiful beautiful cake Lindsay! Pinned! What a GORGEOUS cake!! So perfect for Ashley and her little girl. 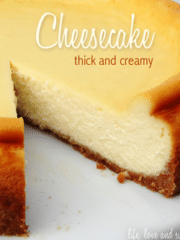 I like very much this recipe! Candratulations! 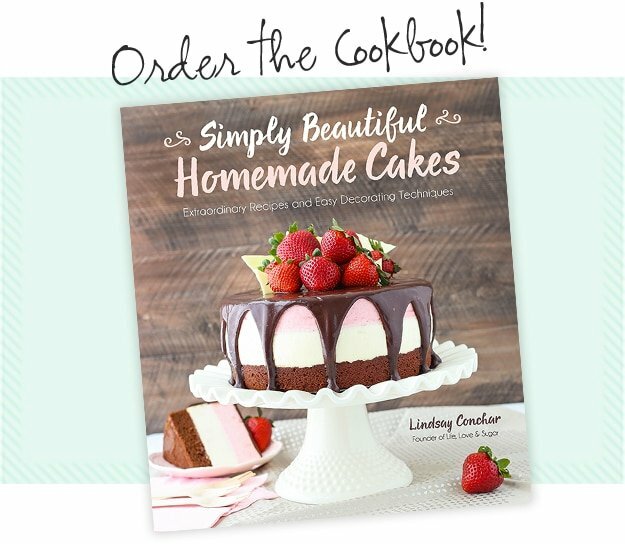 Would it be possible use this cake recipe to do a sheet cake layered cake… How long would it bake for? Possibly, but I haven’t tried it so I don’t know how to advise. on top this frosting, can be put then the fondant to coat the cake? Or in this case, I can use the strawberry frosting only to fill the cake and outside I have to put the classic butter cream for then coat the cake with fondant? 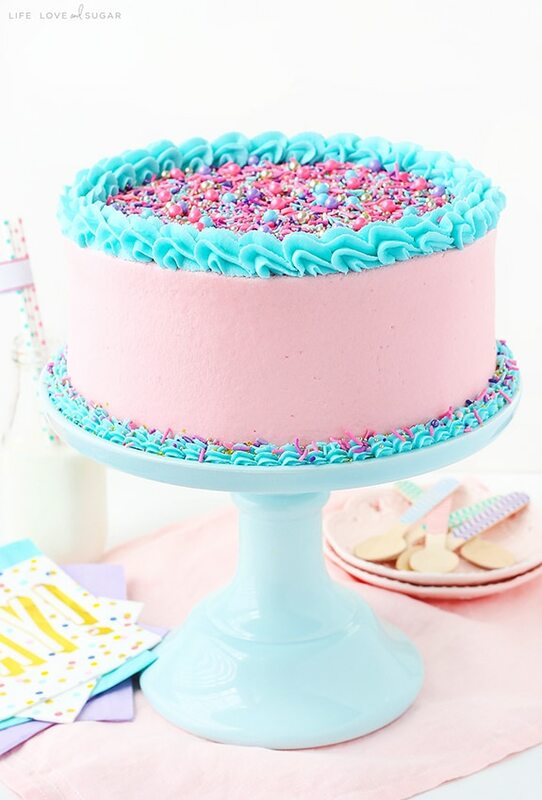 I could look at this cake for hours. It’s so beautiful and fun! Great worth, Lindsay! Hi. I loved making this cake. My husband loves it but I think there really isn’t a strong strawberry taste in the cake. I used fresh strawberries to make the purée. I cooked the strawberries for the purée. Was that wrong? Would it be better not to? 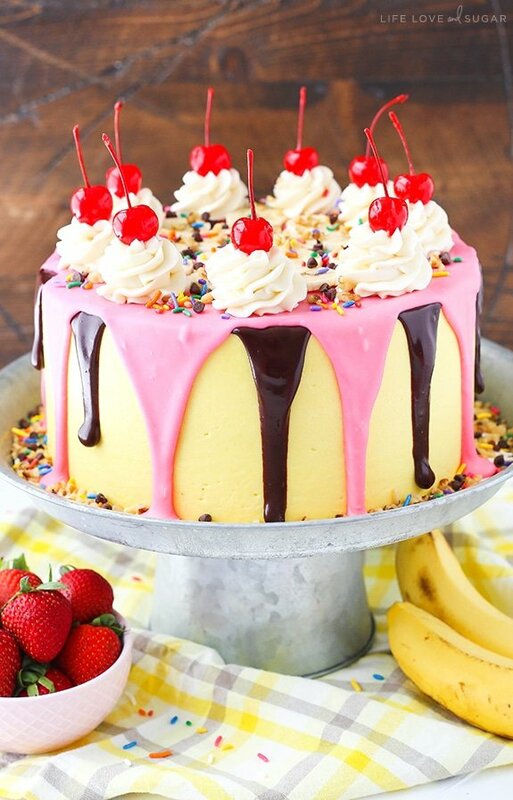 Do you think adding strawberry extract to the cake would enhance or ruin the flavor? Also my cake didn’t seem as fluffy as yours. It seemed dense. Moist yes but not fluffy. I did beat the cream and sugar for at least 4 minutes. Do you think I overbeat the rest of the time when adding the other ingredients? The frosting was scrumptious and I love your recipe because there is always extra. I would love any tips you may have as to why my cake wasn’t fluffy :(. It did taste awesome but I thought maybe it should taste more like strawberry. The frosting tasted very strawberry yummy. Hi Cindi, it can be hard to know exactly want went wrong from a distance. For the flavor, it depends a lot on your strawberries. They better their flavor, the better the flavor of the cake. 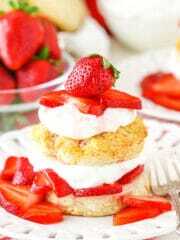 You can definitely use some strawberry extract to enhance the flavor. For the fluffiness, it’s harder to know the issue. Often it’s a lack of creaming the butter and sugar but it sounds like you did that. I’m not sure – do you measure or weight your ingredients? It’s possible that you used more flour? Yikes! I’m about to make this cake and just noticed that you did not specify how much baking soda. Teaspoon or tablespoon? How do you make your strawberry puree? Do you add sugar to it? I am cray-cray about your recipes! I love how you present it and everything. I’m looking forward to trying this recipe for my cousin’s 12th birthday party. Just two questions. One: If I can’t find strawberry puree at the shops (since I don’t have a food processor), can I just use strawberry extract? Two: I only have a 10-inch round baking pan. Will I have to double the recipe? Thank you in advance. Love your baking! I’m so glad to hear you enjoy the recipes! If you aren’t able to use strawberry puree, I’d suggest taking a look at this recipe. There’s still a touch of puree in it, but it can be replaced with water and you can up the extract by maybe a 1/2 teaspoon. It’s cupcakes, but can be doubled for an 8 inch cake. If you are going to use 10 inch pans, you’d probably want either 1 1/2 recipes worth or to double it. I’m not entirely sure which, since I don’t make a lot of 10 inch cakes. I hope that helps! Hi there, I am making your cake for my daughter’s 4th b-day. She loves elephants. Is there anything else I need to do or add to make the strawberry puree for the cake besides pureeing the berries? Also, do you think I can double the puree to provide more strawberry flavor? Nope, just puree the berries! I wouldn’t double the puree, but you could add some strawberry extract, if you like. 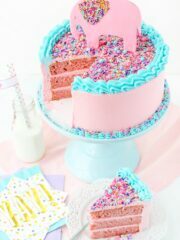 I want to make this for my daughters birthday party this Saturday but would need to make it ahead of time on Thursday. I know you can’t say for this specific recipe but I’m general how ahead of time can you make a cake? 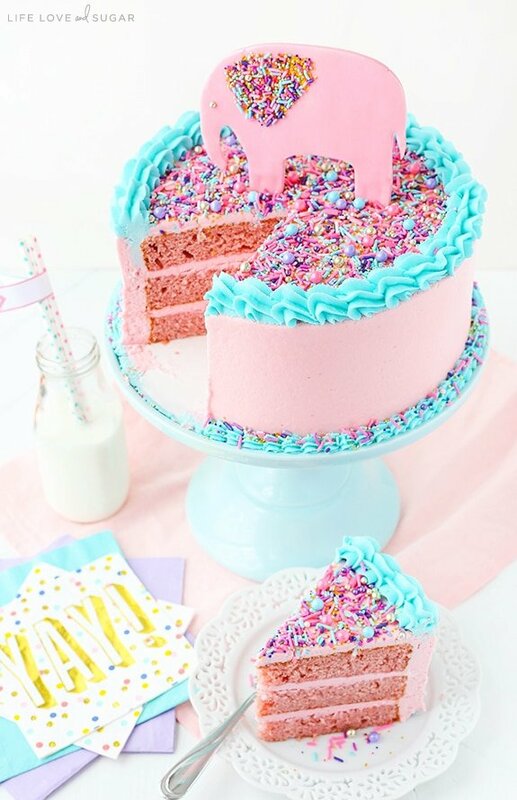 And how would I best store a cake like this one? I generally say a day ahead is best. Two days is fine. I have stretched it to three before and had it be ok though. I generally like to store my cakes at room temperature, but if you are going to make it a few days ahead I might refrigerate it and then bring it back to room temperature before serving it. I have several of these cupcake carriers that I use to store my cakes. 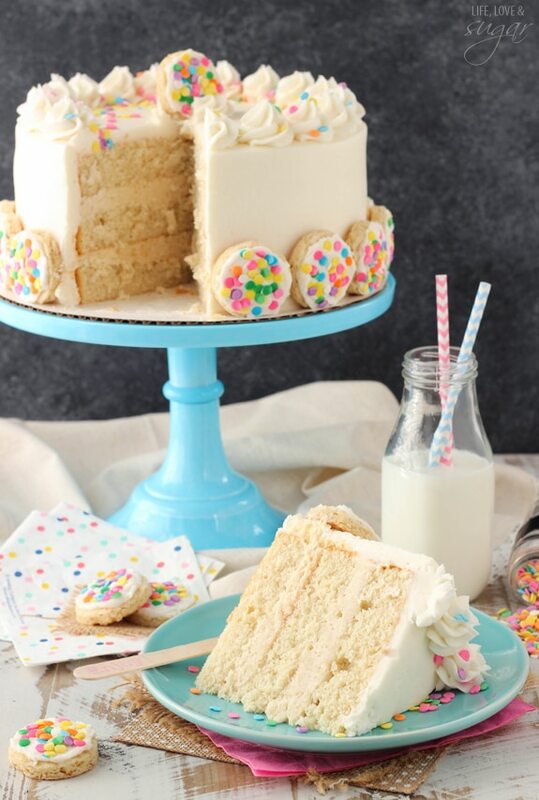 You can remove the cupcake inserts and then it leaves a large space for a tall cake. Hi! could I use frozen strawberries for the puree? Yes, but you really want to make sure to get rid of the excess water. The strawberry flavor comes from those strawberries and if too much water is added from the frozen berries, it’ll water down the flavor.